This event is funded by the U.S. Department of Health and Human Services, Administration for Community Living, Grant #1701GUSGAT. The University of Guam is an equal opportunity provider and employer. May is Better Hearing and Speech Month and this year’s theme is Communication: The Key to Connection. 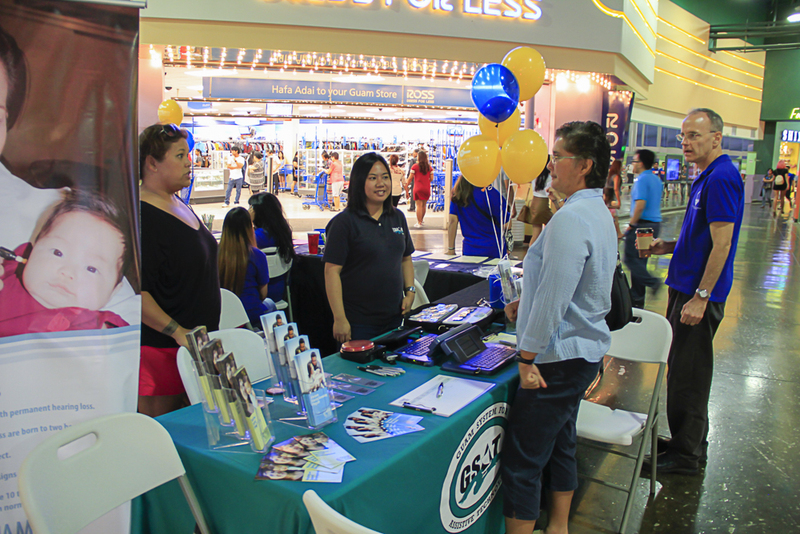 On May 13, two of Guam CEDDERS projects, the Guam System for Assistive Technology (GSAT) and Guam Early Hearing Detection and Intervention (EHDI), participated in the Better Hearing and Speech Outreach event hosted by the Marianas Alliance of Speech and Hearing Professionals (MASHP) at Guam Premier Outlets. (Pictured standing left, clockwise) Mel Torre, GDOE Speech Pathologist; Leah Abelon, GSAT Center Coordinator; David Zieber, MASHP Member; and Royanne Salas, SpEd Teacher. This activity is supported by funding from the U.S. Department of Health & Human Services, Administration on Intellectual and Developmental Disabilities, Grant No. 90DD0014-03-00, and the Administration on Community Living, Grant No. 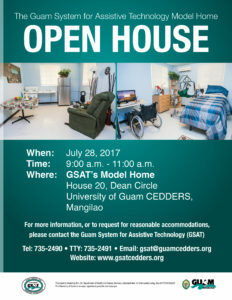 1701GUSGAT, and facilitated by the University of Guam Center for Excellence in Developmental Disabilities Education, Research, and Service (Guam CEDDERS). The University of Guam is an equal opportunity provider and employer. 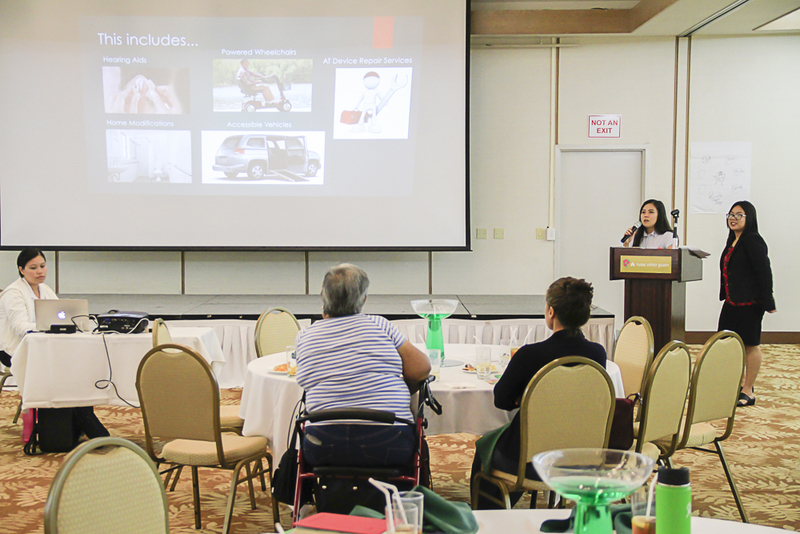 Leah Abelon (standing right), GSAT Center Coordinator, and Christina Jung (standing left), Guam CEDDERS Research Associate, presented information on the Akudi Loan Program during the PEP Island-wide Conference on Disabilities at Hotel Nikko Guam on April 29. The Akudi Loan Program assists persons with disabilities and their families, in purchasing assistive technology devices and services. (Standing; L-R): Christina Jung, CEDDERS Research Associate; Lee Perez; Leah Abelon, GSAT Center Coordinator; Kirsten Bamba, Sign Language Interpreter; Rosanne Ada, GDDC Director; Phyllis Topasna, GDOL/AJC Representative; Lou Mesa, Secretary; Naomi Sanchez, GLSC-DLC Representative; Nichol Napoleon, GDOE Representative; Jude Ogo; Jeff Warfield, DISID/DVR,DSS Representative; Barbara Johnson, Vice Chairperson; Dawn Maka, Member at Large. (Sitting; L-R) Tom Manglona; Victor Tuquero; Josephine Cortez, Member at Large; and Rudy Ignacio, Chairperson. The Guam System for Assistive Technology participated in the 10th Annual Autism Awareness Fair held on April 8 at the Agana Shopping Center. 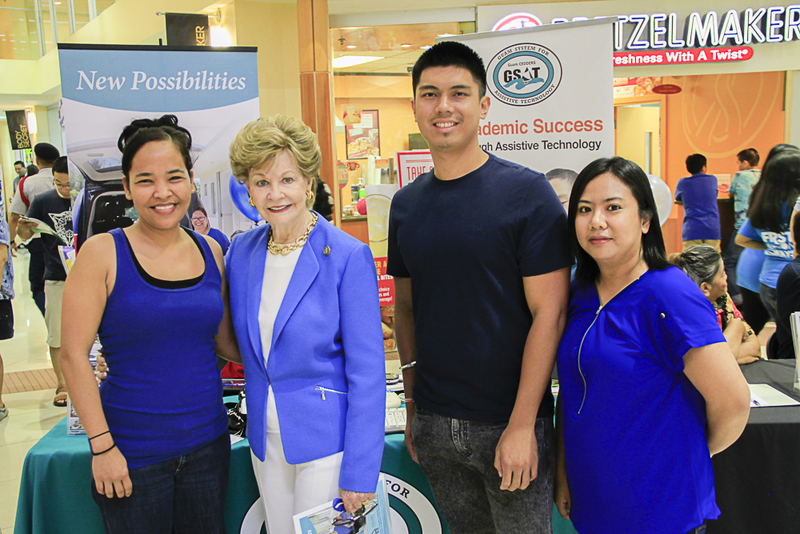 Pictured (L-R): Sylvia Duenas, GCC Human Services Practicum Student; Honorable Madeleine Z. Bordallo, Guam Congresswoman; Leah Abelon, GSAT Center Coordinator; and John Guiao, GSAT Office Assistant.